In his collection of memoirs, reminiscences and anecdotes, A Fiddler Tells All, completed in his 93rd year, Ralph Nicholson recalled his career of over fifty years as a professional musician, from his student days at the Royal College of Music, the RAF, a violinist first with the Boyd Neel and Jacques Orchestras and then the London Symphony Orchestra and thirty years as conductor of the Guildford Symphony Orchestra. 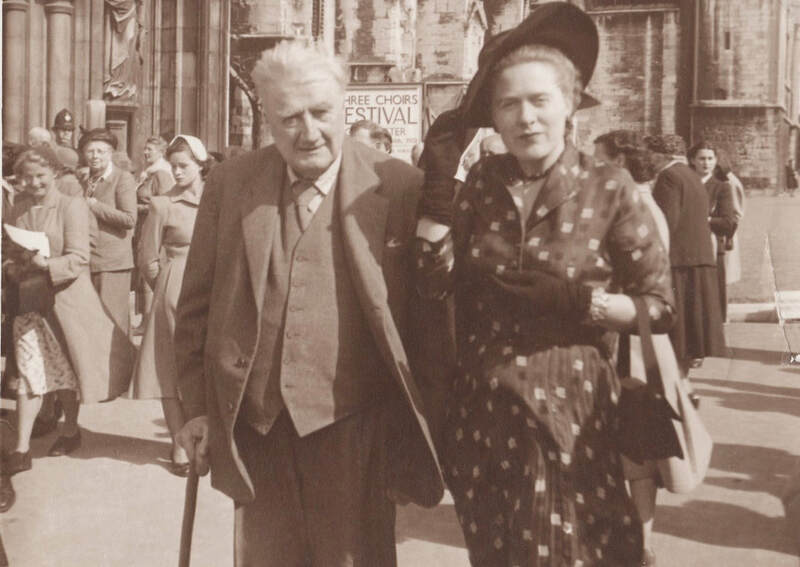 The following extracts are his personal memories of Ralph Vaughan Williams, and are reproduced by kind permission of his daughter, Diana Jerrold, god-daughter of Ursula Williams. "'Uncle Ralph', by which he was affectionately known to people ... was a big man in every sense of the word. He, of course, was one of the greatest British composers of the century. "I enjoyed playing in the orchestra at the Leith Hill Festivals as I played viola for RVW, which meant sitting almost literally facing him and nearly under his conducting stand, and heard all his comments, both public and other more intimate ones. He occasionally got really cross, especially if the choir were slow on the uptake and did not respond quickly enough to his requests, but he would regret almost immediately having shown his displeasure. "At one particular Prom at the Royal Albert Hall, VW conducted one of his later Symphonies himself and elicited a fine performance from the LSO, and naturally, with the great man 'at the helm' there was extra interest and enthusiasm, especially from the young 'Prommers' who gave him a tremendous reception. At the end, after he had gone through every permutation - from getting the Orchestra to its feet to shaking hands with the leader, George Stratton, he leant down and said something to him. In the bar, in the interval, we asked George whether the old man said how pleased he was with the performance. George said: "Oh, nothing like that. He just said - Why do they keep calling me back? Are my fly buttons undone or something?" 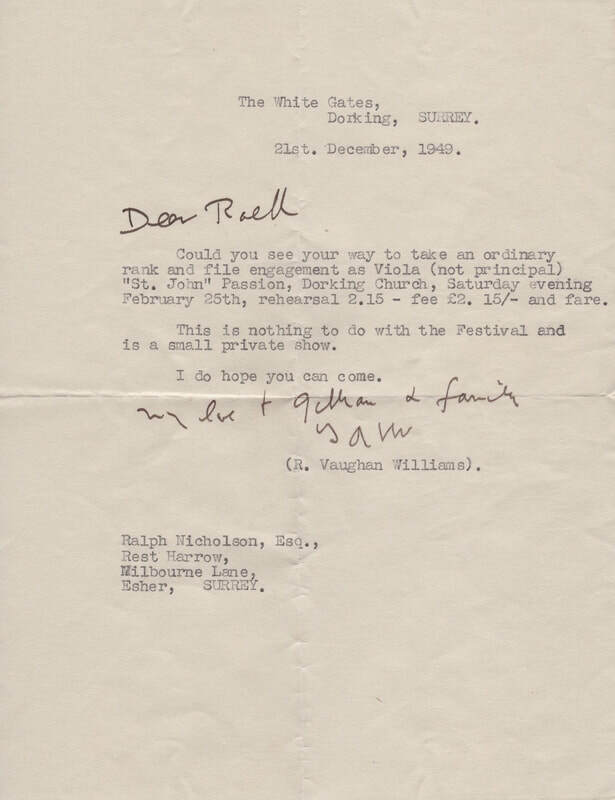 "I happened to see VW one day after I had been playing in the Sea Symphony at the Royal Albert Hall with the Royal Choral Society under Sargent. I couldn't resist mentioning to him something which occurred - or rather didn't occur - when Sargent had conducted the Sea Symphony the previous evening, and quite incredibly omitted the Scherzo movement - After the sea's ships (sic) etc. I never discovered why - lack of rehearsal or what? I couldn't imagine Sargent doing that or even having a dislike of the movement. VW's only comment - "Interfering fellow!" "He was a most approachable man, and although you felt in the presence of 'greatness' he never gave that impression himself and made you feel his equal, and talked to you as man to man ..... He was also a most natural human being. Sometimes even self-effacing, he was friendly and modest. It was a pleasure to be in his presence and a privilege to have known him."